Greetings! Today's post is being done via 4G wireless broadband while I'm working remotely while taking a few days out of the office. I'm a firm believer in backing up. If you've ever been to one of my presentations where I discuss the whole "Flucke" process, you know how over the top I am about protecting my data. So... on the Mac at home I'm currently running Time Machine which is built into the Mac OS. It's not the best backup system, but it does allow for rolling back areas or the entire system in case of disaster. I pair that with a 1Gb portable hard drive from Western Digital. This Passport drive came out of the box with WD Smartware. This software turns the drive automatically into a backup drive with minimal intervention by the user. It can be user configured if need be, but does a pretty god job right out of the box. It takes a system inventory & then does a backup as files change. The next step is an online backup by one of my favorite security companies, F-Secure. Their online backup is $50/year and, like the WD drive, takes a system inventory then copies out files as they are created or changed. These files are stored offsite on a secure server, but can be downloaded by me from anywhere as log as I have my user name & password. Think I'm done? Good, I'm proud of you... because I'm not. I also use a replicating program (Karen's Replicator) for Windows & Synchronize X for the Mac. This allows me to manually backup all my important files for redundancy & quick access. So this is for my redundant photos, music, presentations, documents, etc. The best part is the first 3 options here are automated. Only the last option requires any effort on my part. It's not that difficult & besides you *know* you should be doing it... right... right? Sorry for the lack of posts, even I need some down time occasionally. The 3D Congress in La Jolla this past Friday & Saturday was an incredible success. Every day that I use and explore the technology in my practice, I'm blown away. However, the big thrill is seeing others having the same game changing experiences on a daily basis as me. Truly we're in a time in dentistry that we'll look back on at some point & remember when we turned this corner. Don't get me wrong... I understand for a variety of reasons this technology isn't for everyone... At least as far as ownership. Yet even if you know ownership isn't for you, the tech is something that you need to familiarize yourself with... And use. At this point in the game, 3D is something you need to be comfortable with. Find an office in your area that will do scans for you on a PRN basis so that you can refer there for the scans you need. The more you know of 3D the better for the foreseeable future. The need to see more is important for so many aspects in dentistry. Take my word for it. This technology is eye opening on so many levels! At my talk yesterday at the 3D Imaging Congress, I had the good fortune to be introduced by my friend Dr. Larry Emmott. Larry and I have known each other for 14 years or so and our technology paths cross from time to time. When I discovered he would be introducing me (about 30 minutes before my start time), I dug through the my images on the Mac and found a picture taken by our friend Dan Martinez at Comdex in 1998. The pic showed Larry, our mutual friend David Dodell, and I at the start of the 1998 Comdex show. It was a fun walk down memory lane. However, when I looked really closely at the picture, I could see a banner that said "Don't Forget to Visit the New USB Pavilion". Later Larry and I were talking about that and how in 1998 USB was something new and terribly exciting. I can remember talking about it 6 months later at lecture at the ADA meeting and everyone scribbling notes furiously about the strange animal called Universal Serial Bus. Well of course USB is something now taken for granted as are many other tech things that were huge in their day. Larry and reminisced about drive sizes, memory, portable hard drives, and the computing power in our mobile phones. It's a tremendous compliment to the evolution of the gear that many things now work without a lot of user intervention. So think about that for a minute... the next time you get frustrated because your broadband connection won't download a file fast enough, think back to the old days. We're carrying more computing power in our cell phones than NASA used to land on the moon! That's powerful stuff. If you are in Southern California and either own a cone beam device or are interested in learning more about them, come on down to the 3D Congress in La Jolla. The Congress is a great 2 day learning experience with tons of really good speakers and tons of good information. This is the 4th year of the Congress and last year's was a tremendous success. I highly recommend attending. You'll walk away with a much greater understanding of what this game changing technology can do for you. For all the info, including registration, click here. The folks at High Q Dental are currently taking orders on their soon to ship EOS headlight. I was fortunate enough to get a unit to evaluate and have been very pleased with its performance. The light is incredibly light, weighing in at .4 oz. The overall weight is slightly greater since there needs to be a mounting bracket of some type attached, but even with the bracket, it is still light and comfortable. The full output is 4.500 foot candles which, while not the brightest light on the market, is certainly bright enough for any dental usage. The LED has a lifespan of 50K hours. A feature that I really like is a rheostat to control the light output. Most LED headlamps have buttons on the batter pack to control the light output. Usually you get the choices of low, medium, or high. The EOS has a small knob that can be turned to vary the output from full to off and everywhere in-between. There is also a flip-down orange curing filter that is securely attached and easy to flip down while doing adhesive procedures that are light sensitive. The battery pack charges from an electrical outlet (110v - 240v)and weighs in at 5 oz. It has a clip that can allow it be attached to your belt or placed in a pocket. A single charge will provide light for an entire day of dentistry. The system is available for pre-order now and the entire setup is less than $700. For all the info, visit the High Q webpage. They've been around since the early 70's and make good products! Way back when, Jeff Beezos and Amazon hit the market with the idea of an electronic book. The idea had been tried before, but when Amazon came at it with their huge library available, suddenly the idea was viable... really viable. The Kindle pretty much set the e-book reader world on fire and it sold like the proverbial hot cakes. For a while they were even sold out. The process repeated itself again when version II came out. SEATTLE, Jun 21, 2010 (BUSINESS WIRE) --Amazon.com, Inc. (NASDAQ:AMZN) today announced that Amazon Kindle, the best e-reader on the market (see this recent press release from the world's leading consumer reporting organization--http://pressroom.consumerreports.org/pressroom/2010/06/amazons-kindle-tops-cr-ebook-reader-ratings.html), is now only $189, down from $259. Kindle is the 3G wireless portable reader that allows you to think of a book and be reading in 60 seconds, from wherever you happen to be. Easy to read even in bright sunlight, the 10.2 ounce Kindle is light enough for one-handed reading. Even though it's a 3G wireless device, Kindle has no monthly fees or annual contracts. The Kindle Store includes over 600,000 books and the largest selection of the most popular books people want to read, including 109 of 112 New York Times Bestsellers and New Releases from $9.99. In addition, over 1.8 million free, out-of-copyright, pre-1923 books are available to read on Kindle. 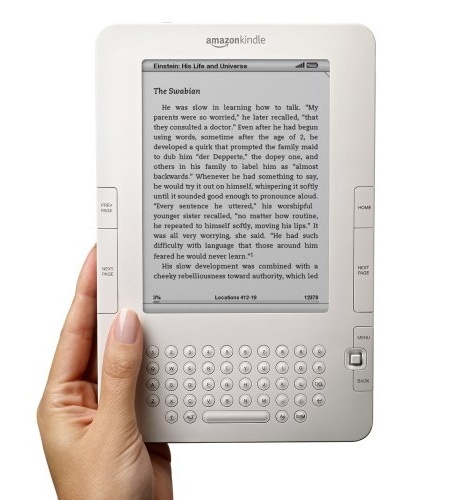 Since its release, Kindle has been the #1 bestselling product across the millions of items sold on Amazon. Kindle is in stock and available for immediate shipment at the new lower price of $189. Learn more at http://www.amazon.com/kindle. We keep hearing about it... The Cloud, like it's some new and bold idea. Actually it's a fairly old idea as technology goes, but it's a good one and I think it is really starting to come of age. The idea goes back as far as the computer network. Back in the day, when networks were first created, data could be stored on a server and then accessed from any workstation on the network. It's a great idea. Store the data centrally and then use it from any machine that has access to the server. The Cloud is that philosophy with the twist of putting the server on the Internet. Thus the Internet becomes the network and the server can be accessed with any computer that has an Internet connection. The simplest form of this for a lot of people is email. If you have a yahoo or gmail account for your email, that's cloud computing. Your messages are stored on the company's servers and you get your email anytime you're on line. Obviously this can greatly simplify your life since you don't have to keep email software running or worry about backing up your account. All of that is taken care of for you by professionals. Online banking? Same thing. Point your browser to the bank website enter your username and password, and you have full access to the data you need with no backing up or anything else on your end. We're finally getting to the point where this is really a reliable way to run a huge part of your life. For me, my contacts and articles are backed up and available to me through a variety of sites. Should I suffer a crash on my primary machine I still have access to my data from any computer with Internet access until I can get the primary machine restored and back online. There are several sites and services that will allow you to do this and this list is by no way meant to be inclusive. I currently use MobileMe (from Apple), Google Docs, SugarSync, and Glide Desktop. Each of these services allows limited amounts of storage and even the ability to edit the documents you store directly from the website. The convenience of The Cloud cannot be overstated. Here's a great example of what you can easily accomplish with little intervention other than installing some software. On my Mac I have a program called "Spanning Sync" installed. Whenever I make a change to my calendar or my contacts on my Mac, Spanning Sync recognizes the change and then sends that info to my iGoogle account. This means new/changed appointments or contacts are quickly updated in The Cloud which allows my schedule to be updated and viewable; usually in a matter of seconds. Then let's take this one step further. Last summer when I purchased my Palm Pre, one of the choices during setup was to use info from my iGoogle account. One the phone was activated by Sprint all I had to do was put in my Google username and password. Within a few minutes my complete calendar and contact list was downloaded and in my phone with no effort at all on my part. Of course, changing something on my phone means it will change on Google and Spanning Sync will catch that and make the necessary changes on my Mac... and all of this normally happens in the background without me even thinking about it. And, of course, the "without me even thinking about it" is the way it's supposed to be right? I mean, for me a lot of this is the Holy Grail of technology. When I can have things in my life happen that make things easier for me and keep me organized with minimal effort on my part. The Cloud is really one of those game changers that I love and I'm embracing it more and more. 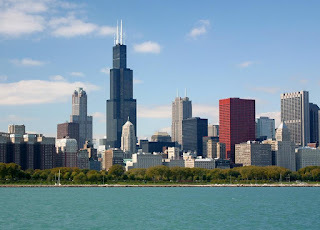 In addition to my normal blogging on all things tech, I'm going to be making some more detailed posts over the summer on some specific cloud based applications that I use and love. Storage, storage, storage. It used to be that you never knew when you would fill up a hard drive. Then desktop computers started getting these ridiculously larger hard drives. Then it wasn't too long after that when hard drive sizes went up for laptops and portable computers. Now, we're going to see a similar explosion for other portable devices. Toshiba has announced that before the end of 2010 they will begin mass production on NAND chips that have 128Gb of capacity. That means you're going to see an amazing amount of storage in portable devices like cameras, video cameras, portable computers, and the like. Very cool and very amazing. TOKYO—Toshiba Corporation (TOKYO: 6502) today announced the launch of a 128-gigabyte (GB) embedded NAND flash memory module, the highest capacity yet achieved in the industry. The module is fully compliant with the latest e •MMCTM standard, and is designed for application in a wide range of digital consumer products, including smartphones, tablet PCs and digital video cameras. Samples will be available from September, and mass production will start in the fourth quarter (October to December) of 2010. Toshiba now offers a comprehensive line-up of single-package embedded NAND Flash memories in densities from 2GB to 128GB. They integrate a controller to manage basic control functions for NAND applications, and are compatible with the JEDEC e •MMCTM Version 4.4 and its features. New samples of 64GB chips will also be available from August. Demand continues to grow for large density chips that support high resolution video and deliver enhanced storage, particularly in the area of embedded memories with a controller function that minimizes development requirements and eases integration into system designs. Toshiba has established itself as an innovator in this key area, and is now reinforcing its leadership by being first to market with a 128GB generation module. Although I love technology, perhaps more than almost anyone else on Earth, I will admit it has its frustrations and its dangers. Some of which are just due to human nature. Unfortunately one of those dangers is the desire to always be connected to our fellow human beings. The good thing is technology is a wonderful way to help us keep those connections. The bad thing is technology can get you caught up in the moment & get you to lose track of your environment. Once, a few years ago, Dental Technology Solutions was asked to do an all day presentation in Manhattan, Kansas, the home of Kansas State University. Paul Feuerstein had somehow managed to get a flight into Manhattan while the 3rd member of DTS, Marty Jablow, had gotten as far as Kansas City where I picked him up and drove him the rest of the way. It was a beautiful autumn Kansas evening as we hurtled down I-70 at 70mph (112Kmh for you international readers). We sat side by side, both of us occasionally checking email or text messages. At one point Marty, remarked, "if we run off the road and die with our cell phones in our hands, that we be the perfect geek way for us to go." While at the time it was a joke, in the years since it isn't so much of one. I mean, this happened back in the day when part of our DTS lectures might be devoted to "how to get email and send text messages on your cell phone" because it was that rare. Now... not so much. I recently finished a great book called Traffic﻿ about the psychology of drivers and how traffic engineers try to manage it. The book, BTW, is highly recommended for analytical geeky types like yours truly. Yet, the reason for today's post isn't because of the book, although it's a good one, no the reason for this post is because of an article I read today on CNN. It seems we've become a nation of texters and emailers. Now that's all well and good until you begin to factor in that we're also a nation of drivers too. Because, let's face it, when you combine driving with any type of device that removes your attention from the road, that's a potential for disaster. As a society we've come down pretty hard on those in the younger generation for being more concerned about Facebook than with the road in front of them, but it turns out, many more of us are just as, if not more, guilty of splitting our attention while driving. One of the really powerful stats I learned while reading Traffic is that a driver is 23X more likely to have an accident when texting & driving. That's not 23%, that's 23 TIMES more likely; and that is a much higher incidence than driving while intoxicated. The day I read that stat I put the cell phone down in the car and haven't sent a message while driving since. For the full article on CNN read it here. I've blogged about it here before, but if you absolutely cannot spend time behind the wheel without sending a message, first of all check your priorities. Next, get an account from Jott. Jott will let you call a number, dictate a message, and then convert it to text and send it to the recipient you state. All while you keep your hands on the wheel and your Bluetooth headset securely on your ear. So it's not just the youngsters or the crazies, it's all of us even though many of us have a hard time admitting it. Stop it please. I'm tired of watching you swerve and having to maneuver around you. June 17, 2010, Chicago, IL—Oral Health America (OHA) announces the launch of Fall for Smiles®, a public messaging campaign conducted in collaboration with Oral Healthcare Can’t Wait®, an initiative of the Dental Trade Alliance. The campaign begins in September to promote messages to consumers about the importance of self care, good nutrition, regular dental visits, and tobacco avoidance in maintaining oral health. During the campaign, OHA will announce the results of a public opinion survey on consumers’ beliefs about oral health. Sponsored by Oral Healthcare Can’t Wait and Plackers dental flossers, the survey of more than 1,000 adults and more than 1,000 children asked questions about oral care habits and perceptions. Prior OHA surveys have shown that adults are unaware of the role that infectious bacteria play in tooth decay, and that time spent brushing teeth tends to diminish at nighttime and on weekends, suggesting that routines play a role in optimum oral care habits. Fall for Smiles will include outreach to dental care providers through a participation booklet and kit created by Patterson Dental. The campaign will also dedicate a week to the often-overlooked topic of oral health issues faced by mature adults and older Americans, an initiative being sponsored by Aspen Dental. A “Tobacco Free Week” will focus on the oral health risks of tobacco use. Fall for Smiles is generously sponsored by Aspen Dental, GlaxoSmithKline Consumer Healthcare, Oral Healthcare Can’t Wait, Patterson Dental, Plackers dental flossers, and Trident®. Fall for Smiles promotion partners (confirmed to date) include Aegis Communications, American Dental Hygienists’ Association, Association of State and Territorial Dental Directors, Belmont Publications, DentalEZ Group, DNTLworks Equipment Corporation, Harry J. Bosworth Company, Henry Schein Dental, Hispanic Dental Association, Lanmark, Smiles Change Lives, and Ultradent. Contact Melissa Hoebbel, melissa@oralhealthamerica.org or at (312) 836-9900 for a campaign partner prospectus or to learn more! Oral Health America’s mission is to change lives by connecting communities with resources to increase access to oral health care, education and advocacy for all Americans, especially those most vulnerable. For more information, visit www.oralhealthamerica.org. Some things just Want to Be Free... and WiFi is One of Them! I'm a self confessed coffee hound. Well, I'm sort of a self confessed caffeine hound, but that's another post. The strange thing is that when I'm at home, I'm a traditional grind the beans and drink it black kind of guy. However, put me in a Starbucks and I'm a triple vinte hazlenut soy latte kind of guy; strange huh? Don't answer that. I've got to hand it to Starbucks, they've become the McDonald's of the coffee world. It always tastes the same, you know how to order, and they are everywhere. There's also the environment. They've done a great job of creating an atmosphere that is relaxing and encourages you to stay for that second unneeded cup of joe or to purchase a travel mug for about twice what you could buy it for anywhere else. The idea of course, is to get the customer to linger. Lingering customers in those environments spend more and tend to return more. That's why I could never understand why they partnered with AT& T and tried to charage you for wireless Internet access. I mean, seriously, I'm paying more than $5 for a cup of coffee and you need me to pay for Wifi? Now not everyone had to pay. AT&T customers could get a couple of hours free, but you would see me writing an article and accessing the net using my Sprint Mobile Broadband. It just seemed like a crazy business strategy. Well starting July 1, that's all about to change. That's when Starbucks (like McDonald's) is going away from charging for wireless and making it free. Now that's good customer service! OREM, UT—Curve Dental, developers of Web-based dental software announced the company was one of thirteen companies to receive the Pride Institute’s Best of Class Technology Award for 2010. Curve Dental was a winner in the emerging technology class. were chosen through an unbiased, rigorous assessment selection process in conjunction with a distinguished panel of known technology experts. The winning technologies were selected by majority vote and divided into four categories: Foundational, Diagnostic, Therapeutic, and Emerging. The panel consists of seven dentists with significant knowledge of and experience in dental technology, including Dr. Shuman; John Flucke, DDS, writer, speaker and Technology Editor for Dental Products Report; Paul Child, DMD, CDT, CEO of Clinician’s Report; Titus Schleyer, DMD, PhD, Associate Professor and Director, Center for Dental Informatics at the University of Pittsburg, School of Dental Medicine; Marty Jablow, DMD, technology writer and speaker; Para Kachalia, DDS, Assistant Professor of Restorative Dentsitry at the University of the Pacific, School of Dentistry; and Larry Emmott, DDS, technology writer, speaker and dental marketing consulting. “I feel very fortunate that a panel of this magnitude has agreed to contribute to the selection process,” said Dr. Shuman. Founded in 2005, Curve Dental provides web-based dental software and related services to dental practices within the United States and Canada. The company is privately-held, headquartered in Orem, Utah with offices in Calgary, Canada and Dunedin, New Zealand. Dentists can call 888-910-4376 or visit www.curvedental.com for more information. If you're going to make an investment in your reading like buying an Amazon Kindle, that means you're going to be using it a lot right? Well, maybe I'm old fashioned, but I figure that if you are going to drop around $259 on a device to read with, you'd better be reading! Of course that's all well & good as long as you're at home, the office, or a hotel room or plane. The real problem comes when you want to go "remote" with your Kindle. How do you keep it fresh, shiny, and most importantly functioning if you are truly using it on the go. 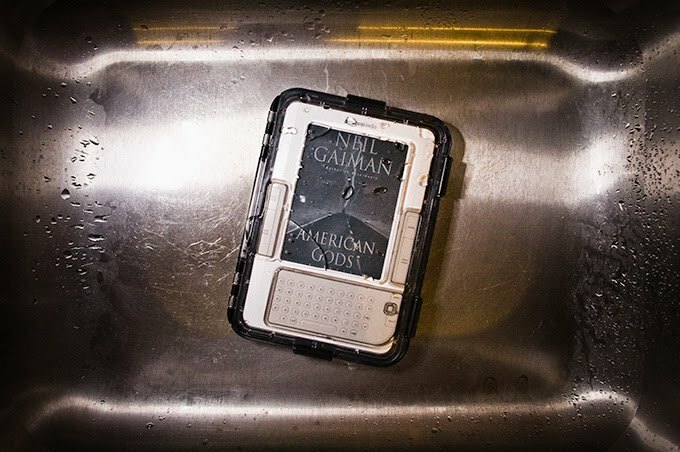 Let's face it, if you drop a paperback in a puddle, it's just frustrating. You drop your Kindle in it and it's a reason to cry. Well, cry no more! The good people at M-Edge have created a hermetically sealed case that allows you to take your trusty Kindle almost anywhere... even in the pool!!! The Guardian Case for the Amazon Kindle isn't cheap at $79.99, but then again buying a new Kindle isn't cheap either. This little miracle of engineering allows all the buttons to work and even keeps the Kindle afloat in the pool. Cool huh? Visit the company website for all the info. While strolling through the aisles of the FNDC show floor on Friday, I came across Vector Research & Development, Inc. This is a company who's goal is to provide well thought out products at affordable prices for dentistry. I was really intrigued with the Ultrasonic Scaler above. 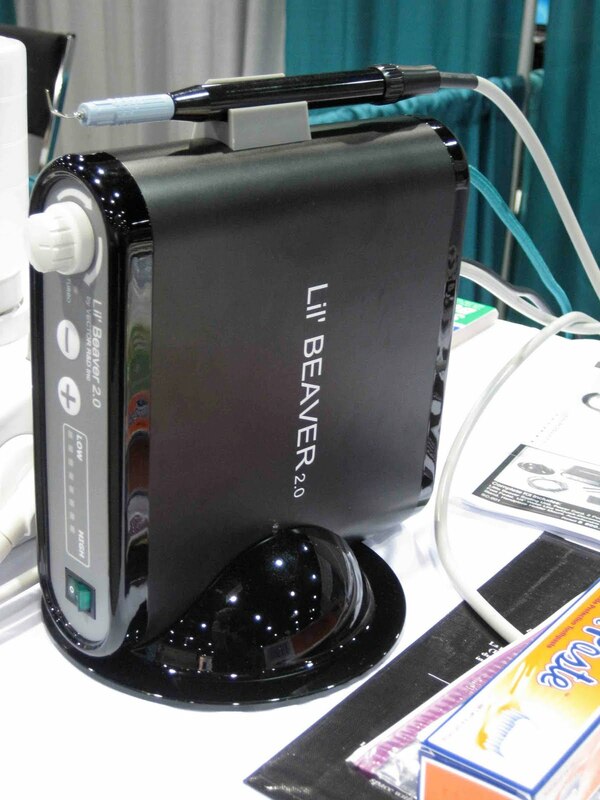 Dubbed the 'Lil Beaver, the newly redesigned unit is built to compete with more expensive models while keeping the price in the $500 range. At that price I was intrigued and so the good guys at Vector are going to send me a unit to evaluate. As usual, we'll put it through the paces and see if our newest hygienist, Sarah, can find any weaknesses. I've got to tell you, I'm impressed with the design and aesthetics of this device. Many dental ultrasonic units aren't the most beautiful things to look at. When we get ours in, I'll let you know. For all the info on Vector, check out their website. One of the really fun things about traveling and lecturing is getting to see some of the really cool companies that participate in state meetings. On Thursday and Friday I was lecturing at the Florida National Dental Conference and I had a chance to check out the exhibits and see some cool stuff. One of the companies I came across was Gator Paste, Inc. It's a company, run by a dentist, with a neat marketing idea. 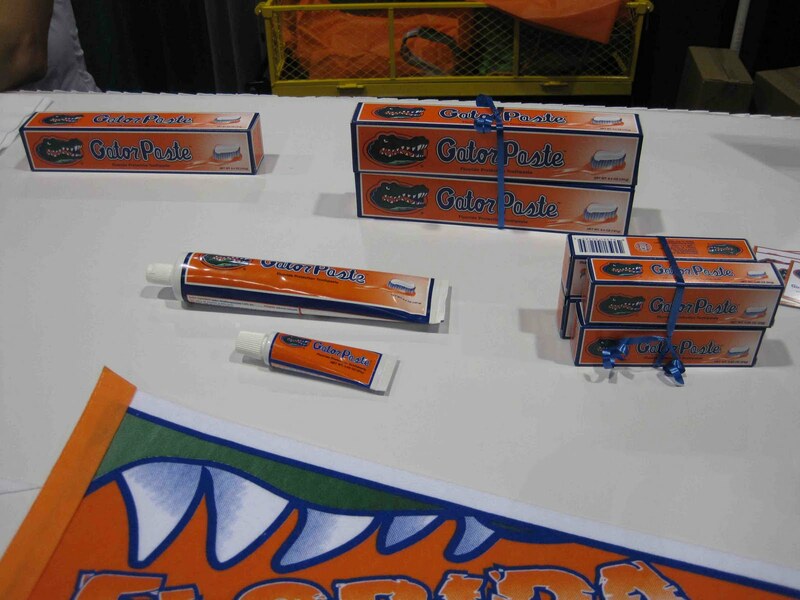 They have an agreement with the University of Florida to sell "GatorPaste" a toothpaste branded with the U of F Gator. It's a great idea, but it doesn't stop there. Before the fall, you should also be able to buy toothpaste featuring the Florida State Seminoles and the Miami Hurricanes! The company is also in negotiations to have "Buckeye Paste" for The Ohio State University and possibly even "Wolverine Paste" for the University of Michigan. Personally I'm hoping for MU, KU, and KSU paste for our local 3 schools here in the KC area. 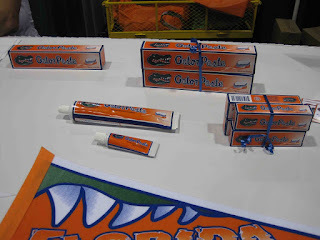 I even bought a case of Gator Paste just because it was such a novelty! For more info take a look at the Gator Paste site! 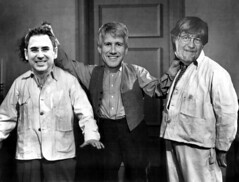 On my left is good friend Marty Jablow and on the right is my pal Paul Feuerstein. Links to their blogs can be found on the top right of this page. This was Greg's response to that. I've recently been introduced to a company called Osspray. Their idea is simple... yet better. Rather than using some type of an air polisher such as a Cavijet loaded with a mild abrasive, why not make the powder part of the treatment? Sylc is calcium sodium phosphosilicate, a powerhouse of bioactive materials with decades of proven benefits. When combined with saliva or water, Sylc forms hydroxycarbonate apatite crystals (HCA) that become entrapped into the collagen of dentin and biologically bond into the mineral surface to promote regeneration of dentin and damaged tooth surfaces. Unlike traditional desensitizing varnishes or pastes, Sylc provides superior relief from painful hypersensitivity without unsightly discoloration or unpleasant taste or feel. So, I'm thinking, why not give this a try? We'll be using it on patients very soon and we're anxious to get feed back. For all the details, check out the website. Defibtech, LLC, is initiating a voluntary recall of 5,418 DBP-2800 Battery Packs used in the Lifeline AED® and ReviveR AEDTM (semi-automatic external defibrillators). This recall affects all DBP- 2800 Battery Packs shipped prior to June 4, 2007. In rare instances, when the AED is used with an affected battery pack, the AED may falsely detect an error condition during charging for a shock, then cancel charge and not provide therapy. Defibtech determined the need for this recall after learning of four reports from end users of this malfunction during patient use. The company has identified recommendations for the end customer to follow until the battery pack has been corrected, which allows the battery pack to remain in service. A copy of these recommendations is being mailed to all affected customers. This customer notification, as well as instructions on determining whether a battery pack is affected, can also be found on thewww.defibtech.com/batteryFA web page. For additional information regarding this recall, please refer to the above referenced web page, contact your distributor, or contact Defibtech at techsupport@defibtech.com, 1-877-453-4507 or 1- 203-453-4507. Defibtech will provide customers with a free battery pack update card to address this issue for all affected battery packs. The correction to the battery pack will be able to be performed at the location where the battery pack is deployed using any DDU-100 series AED and a Defibtech supplied battery pack update card. The battery pack update is expected to be available within the next two weeks. The DBP-2800 battery packs affected by this recall have been distributed globally to fire departments, EMS, health clubs, schools, and other organizations. The affected battery packs are used in AEDs which can be identified by the words "Lifeline AED®" and "ReviveR AEDTM" on the front of the device. The Food and Drug Administration (FDA) has determined that this action is a Class I recall. Any adverse reactions experienced with the use of this product and/or quality problems should also be reported to the FDA’s MedWatch Program by phone at 1-800- FDA-1088, or on the MedWatch website at www.fda.gov/medwatch. I love WiFi!!! I was thinking the other day how much wireless has changed my life. I spend my time in my office and at home enveloped in the high speed goodness of an untethered broadband connection. Whether it's using my iPod Touch at the office or my iPad at home, I'm rarely without the net anywhere I'm based. I've even upgraded my traveling wireless broadband this week by picking up the Sprint OverDrive 4G wireless hotspot. Now comes word that the Wi-Fi Alliance, which is the industry standard bearer, has announced adoption of a brand new standard that may boost data speeds potentially 10 times at short distances. It will use a 60 GHz frequency (currently we're using 2.4 GHz). The current thinking is that it may very well show up first in Blu-Ray players that will allow them to wirelessly stream video to TV sets that are setup to receive the signal. Other devices will obviously follow. The bad news? The new standard isn't expected to arrive for 2 years. Bummer, but it's worth waiting for. The folks at AdDent make some really incredible products. They are what I like to refer to as "better mousetrap" products where they take an idea and improve on it so much you simply can't do without it. The Calset is one of those devices. It consists of a base that is plugged into a standard AC outlet. The base gently warms in about 10 minutes. On top of the base, you can place several different modules that hold different materials. The one pictured above, is warming compules pre-loaded into dispenser guns. However, there are also modules to hold individual compules, composite syringes, anesthetic cartridges, a veneer tray to organize and warm bonded veneers, and soon there will be an instrument warmer as well. The composite suffers no ill effects from being warmed and is actually much easier to place as even the stiffest consistencies flow easily when gently warmed. This means better adaptation, easier placement, and faster procedures for the patient. Using the Calset is an everyday part of our restorative routine and makes our lives, and the lives of our patients, much easier. This is one of those products I just couldn't do without! It is highlly recommended!!! As you know, I was resisting the iPad. I have a Tablet PC with a Sprint USB broadband device and I couldn't see for sure what the iPad could help me do that I couldn't do already. Well I wanted to try one, but I didn't really feel like buying one "just to see". Apple, of course, isn't turning loose of lots of review models, so I figured I'd have to wait until I got feedback from some friends. It turns out that one of my buddies (Thanks Ben!) was nice enough to reset his and loan it to me so I could give it a try. It turns out that the iPad has made itself almost indispensable to me. Let me explain why. Speed - The software is blazing fast. If you have an iPhone or an iPod Touch, you understand what I mean. You tap an icon and the program loads and is working inside of 5 seconds. With my Tablet PC, it grinds away before I can do anything. Depending on the size of the program, this can take up to a minute or two. Software/OS - One of the big things I've always liked about Apple products is how well thought out the software is. As an example, answering email on the iPad is a breeze. The program loads blazingly fast, it's easy to highlight for mass deletes, the layout is crisp and easy to use, and the soft keyboard appears like magic whenever you need it. I was concerned that typing would be difficult. Even if you are a 2 finger typist, it's easy to use. Add in the fact that it syncs my contacts, calendar, and anything else I need to run my life and you can see why it's a hit with me. Apps - You've got to hand it to Apple. The entire culture they've built around The App Store really drives their portable products. I'm doing almost everything from a small slate type device that I normally do from a heavy and bulky laptop. So much of my life is in the cloud now and the iPad with its Apps connects to it beautifully. No matter what you need, there really is an app for that! I've ordered the 64Gb version with Wifi only and no 3G connectivity. That may seem silly for a gadget guy like me, but let me explain why. Since I'm on the road so much, I already have the above mentioned Sprint Sierra USB wireless broadband modem. Now one drawback on the iPad is no USB ports so if I wanted broadband coverage, I'd have had to pay more for the iPad and then about $30 per month to AT&T for the connection. So instead, I've ordered the Sprint OverDrive 3G/4G Mobile Hotspot. This device will replace the Sierra USB and provide wireless broadband for up to 5 devices. This means my iPad can connect via Wifi to the OverDrive and I won't need to be paying anything extra to AT&T. Putting this thing in my pocket for around town or in my carryon bag when i travel will give me what I need with no increase in monthly charges. FOR IMMEDIATE RELEASE – May 27, 2010 - LAKE FOREST, Ill., - Hospira, Inc. (NYSE: HSP), a global specialty pharmaceutical and medication delivery company, announced today it is voluntarily expanding its March 31, 2010, recall of Propofol Injectable Emulsion 1% and LiposynTM (Intravenous Fat Emulsion) products which include Liposyn II 10%, Liposyn II 20%, Liposyn III 10%, Liposyn III 20%, and Liposyn III 30% to the consumer or user level. Hospira is conducting the recall because some of the containers may contain particulate matter. The particulate is primarily made up of sub-visible inert stainless steel particles. JUNE 1, 2010 THROUGH JULY 1, 2011Hospira initially announced a recall of propofol and Liposyn to its customers on March 31, 2010. The expanded recall announced today affects additional lots of propofol and Liposyn distributed during a wider timeframe to capture all product that might currently be in customer inventories. 20 mL, 50 mL and 100 mL sizes. Liposyn containers come in 250 mL and 500 mL sizes. This recall is being conducted with the knowledge of the U.S. Food and Drug Administration (FDA). ANYONE WITH AN EXISTING INVENTORY SHOULD STOP USE AND DISTRIBUTION AND QUARANTINE THE PRODUCT IMMEDIATELY AND CALL STERICYCLE AT 1-877-884-7835 TO ARRANGE FOR THE RETURN OF THESE PRODUCTS. FOR MEDICAL INQUIRIES, PLEASE CONTACT HOSPIRA MEDICAL COMMUNICATIONS AT 1-800-615-0187. Apple Shuts Down Lala - Will iTunes Move to the Cloud? A while back, (December to be exact) Apple purchased the music website Lala for an undisclosed price. The site had been around for a while and offered music lovers the opportunity to stream songs from their over 8 million song library. You could listen to a song once for free and could purchase unlimited streams of a song for 10¢ per track as well as allow registered users to download MP3's for a purchase price of 79¢. There was speculation when the purchase took place that it was a perfect opportunity for Apple to make a move to put iTunes in the cloud. The speculation has now begun to really build along those lines... for a reason. On Monday, Steve Jobs will announce to the world the worst kept secret of his career. The new iPhone will be shown "officially" even though a prototype was found in a bar a while back and has been photographed and dissected. However, Steve Jobs also has mentioned that despite the well known iPhone 4.0, Apple fans will "not be disappointed" by something else coming on Monday. Interestingly enough, the Lala website went offline on May 31st with users being told that any credits they had could be redeemed in the iTunes store. What many are speculating, and I'm one of them, that Lala and iTunes will somehow be merged putting iTunes into the cloud. This would allow users to access their full music libraries from anywhere with a net connection. This would be the ideal solution for people with large music collections that won't fit on the current memory offerings on iPhones. For the last several years, Apple has offered online storage for a fee through their iDisk service and this whole concept just seems to be the next generation of that concept. The only problem with this idea is the fact it would put even more of a strain on the already overly strained AT&T network. And the network is strained because of... the iPhone. It's sort of a Catch-22. I for one would love knowing all of my media is backed up by Apple and available to me anywhere I go. I'd be willing to pay for the service, although I haven't given much thought to how much it is worth to me. Here's hoping this is the surprise that Jobs has been promising. I think it's a very smart move. I'm in Chicago today working on the set of Second City where I'm filming another episode of The DEN. The Dental Entertainment Network is a great way to learn about new dental products... and it's a heck of a lot of fun to do too! Today we'll be doing some videos for Tokuyama and their line of Estelite composites. I'll try and send some photos out via my Twitter feed and I'll definitely be sending out Twitter updates throughout the day's shooting. Sorry for the lack of a post yesterday. A summer bug knocked me down for about 24 hours taking me away from patients and away from posting. However, now I'm back and ready to go; thank goodness for the History Channel as I now know more about Alaska than ever before. I'll be back to posting on my regular schedule tomorrow. Here's a nifty little system for your desk. The t'Light has an LED lamp that is good for 50,000 hours and the base is a recharger's dream. 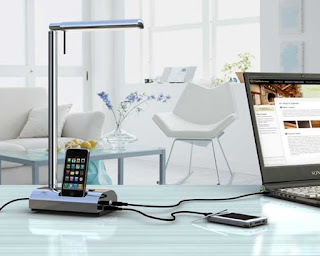 Not only do you get the light, but there is also a powered USB port, iPhone/iPod Touch charging dock, and a jack that can power lots of things... even up to a laptop. The device is $90 and can be purchased in several colors. You can always do with fewer cords in your life right? I know I can.